The right-wing said this animated story of a bullied kid, a pack of zombies, and an ancient curse was part of the secret gay agenda. So we asked the movie's creators what they have to say for themselves. 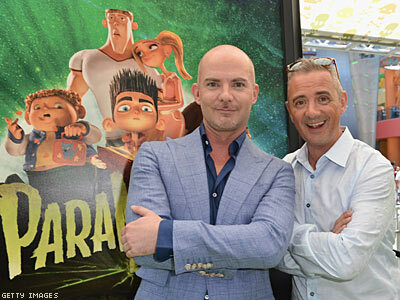 As the DVD, Blu-Ray, and Ultraviolet versions of ParaNorman today hit stores and computers (and iPhones, if you get pocketBLU), we talked with animation's hottest dream team — gay writer/director Chris Butler and his (not gay) co-creator, director Sam Fell — about their smash animated film. They also touch on The Breakfast Club, stop-motion animation, and their so-called gay agenda. And all of that means there are spoilers for those of you who haven't seen the story of a bullied kid, a pack of zombies, an ancient curse, and a gay jock. 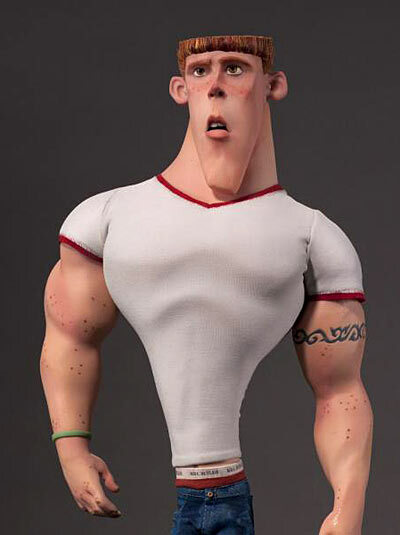 The Advocate: I believe that ParaNorman is the first mainstream animated film with a main character who is gay. I loved that it was a punch line, but not at Mitch’s expense. Butler: Yes, I believe it is. It was important to us. We were telling a story that was fundamentally about intolerance. We believed that it was important to have the strength of our convictions. And yes, we played it off as a punch line to a joke. But in a sense, that made it all the more potent, I think, because Mitch is just an ordinary guy — and what I wanted to do with the script throughout the story was, first of all, to turn preconceptions on their head. But also, every character in the movie is judging someone else, good and bad, usually misjudging, and I wanted to make the audience complicit in that. You think you know that a zombie is going to want to eat your brain, you think that this dumb jock is straight. Actually, you don’t know everything just by looking at them. That was important to me. And also, I thought it was a funny joke. The film was sort of the perfect animated film for our time because it tackles bullying and tolerance and all these things without hitting us over the head with it. It’s this really kid-friendly horror story. Fell: It’s actually an important thing in a film, not to say it too loud or not let the message overpower the film or muddy the entertainment value, if you want. People don’t want to be preached at; they want to be entertained. But we believe you can do both — and if you can do that, then you’re on to a good thing, I think. Butler: I always think there’s something very healthy about irreverence, particularly, a lot of the movies and TV shows that inspired this from my youth, were family movies. But they went a little further. They weren’t afraid of challenging subject matter. If you look at The Goonies or E.T., something as simple as family dynamics — they weren’t afraid to show dysfunctional families. Perry and Sandra are not the most perfect parents in ParaNorman. But in a sense, that was important to us. It’s relatable. They’re kind of crappy parents. They’re no less loving but they make mistakes. Every kid knows what it sounds like to hear their parents argue. That makes it real. I personally don’t believe you should polish all that away from children’s fiction, because you’re not actually making it relatable to the real world. Fell: It’s strange, isn’t it, to have films that are just so far behind the current times. Mainstream entertainment is often five years behind the reality, and that’s a strange thing. When I was watching ParaNorman, I was getting a little bit of a Stand By Me vibe. Butler: Yeah! There ya go, that’s it. I was sort of wondering if you thought kid’s movies were a little riskier in the '80s. Fell: They were, they definitely were, absolutely. Another thing about Stand By Me, and also The Breakfast Club — those movies were just about character. A lot of it was about character, and a lot of screen time was given to characters, for you to just see other people and how they think and feel. That gets lost nowadays. Butler: Yeah, a popular movie these days is very seldom just about character, it is about spectacle. We actually believe you can have both. It was the reason for having our huge climax be like this double-edged sword. Yes, you have all this spectacle of this well falling apart and this fantastic looking witch ghost. But actually underneath it, it amounts to two 11-year-olds having an argument. And it was fun to play with that, to really base a lot of the story-making decisions on real character, not on fart jokes or pratfalls, or more safe, standardized formula. Although with stop-motion animation, it seems like it’s much more work. Fell: I don’t think it is. It’s a different kind of work in many ways. Both our medium and CG animation take about the same amount of time. We do get some things for free that CG really struggles to do. We build our costumes and our puppets and our sets, and we put normal real light on them, and we film them with decent but not super-expensive cameras. We have this amazing effect of real photography. And it’s something that CG movies spend gazillion of dollars trying to emulate. Butler: I think also, when you look at the production of a CG movie, you’re going to see rooms full of people sitting at computer screens. When you look at the process that we’re involved with, we’ve got a warehouse full of craftspeople and artists and artisans who are building things with their hands. It’s like a flurry of activity — it’s like Santa’s Workshop. I think that’s what makes it look like it’s so much more labor intensive. But in fact, all these things are not easy. Any animated movie takes a huge amount of work and time. With all that kind of craftsmanship that goes into this kind of film, does that mean as directors, you get your hands a little more involved in things like costume design? Butler: Yeah, you’re literally in the film. Everyday, you walk around, and you’re inside the movie. You look to your left there’s the next set being painted and you look to your right, there’s a bunch of wigs being developed for a new character, so you’re completely immersed in its. Fell: There’s something liberating as a director to actually point at an object you’re talking about, rather than just pointing the finger at a screen. I saw some of the small models when I was at the premiere which was endlessly fascinating Mitch, the gay character. I noticed a lot of parent blogs wrote something like, “Great film about tolerance, too bad it had a gay character at the end.” Did that reaction make you laugh? Butler: [Laughs] It is funny. It’s sad though. It’s absolutely bizarre to me that people cannot see what the movie is about. They can quite happily talk about tolerance without understanding what it means at all. That’s sad. It’s very sad to me. But that makes it all the more important to make those kinds of choices in filmmaking. That makes it all the more important for me to make family entertainment and push the boundaries. Because the only way we’re going to change that kind of stupidity is one step at a time. Fell: It becomes an everyday thing. That’s why it was put at the end as this kind of throwaway thing. It’s not a big deal. Here’s the fabric of the world, everybody. Here’s Mitch. That’s reality. America has a black African-American president now; that’s equally shocking. I think that one of the conservative pundits had a piece soon after the film came out that said it was only a matter of time before the gay community targeted children with films like ParaNorman. I think they were trying to say that you, Chris, being gay, meant that this is part of your so-called gay agenda. Butler: [Laughs] My insidious agenda getting out there. So Sam, you also did Flushed Away, which is also this sort of contemporary type of film in which you didn’t have to be a kid, or have a kid, to enjoy it. Is this type of storytelling — smart on multiple levels — the future of animation? Fell: This medium is not just for kids. It’s for everybody now. It’s actually the perfect family medium. I can’t take credit for all the animation that’s going on in the world right now, but it’s interesting it is thriving when a lot of moviemaking, a lot of aspects of cinema, are dying out. The animated family movie is alive and well, and it’s a very interesting time. Butler: What’s cool about that is, you can make those movies, but that’s never to say that’s all you can do with animation. I’m happy to have movies that appeal specifically to young kids, or movies that appeal specifically to adults. There is no reason that we should ever limit animation as a medium to one genre or one age group. It should be able to tell any kind of story. Fell: Well in other parts of the world, it does. In Japan it’s completely venerated as a very serious medium.